I am still calling this an alphabet for starters activity but really my little girls is graduating to just plain alphabet activities. 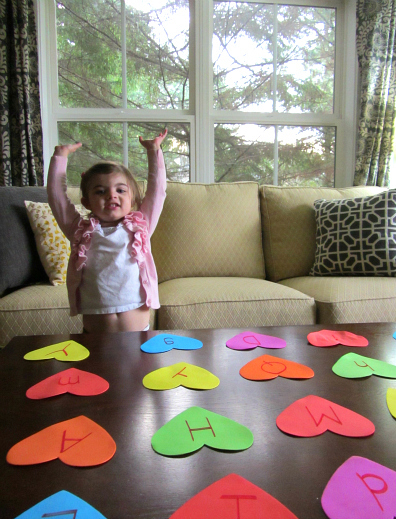 Matching upper and lowercase letters is not really a beginner activity but the playful way to learn with a memory game still meets the goal of this series . 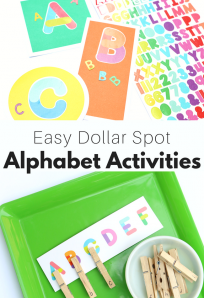 Playful alphabet activities. 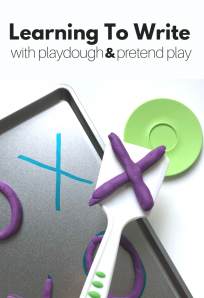 This game would be a cinch to adjust for more novice learners. 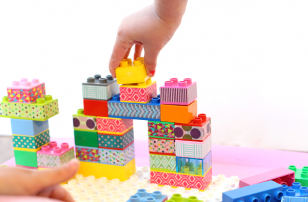 Simply stick to only one case of letters or scrap the memory game and try something more straight forward like my friend Jamie did a few days ago on Hands On As We Grow. 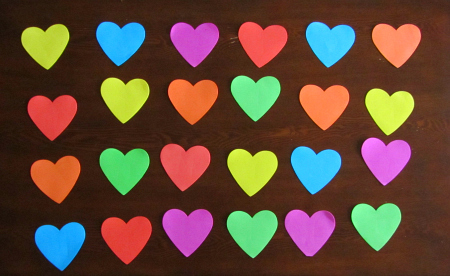 To make it tougher skip using the scaffold of the matching colors and use only one color of hearts. 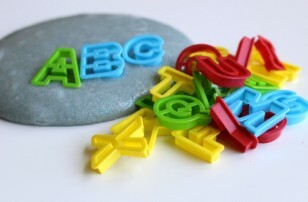 To see our other Alphabet for Starters activities see our list here. Gather your materials. 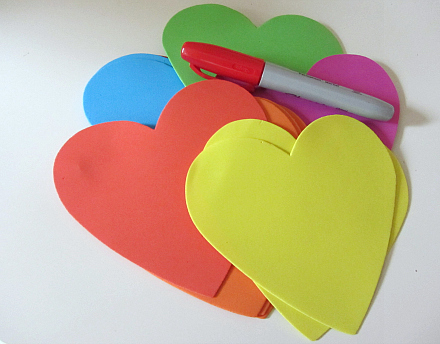 You will need a sharpie and some colorful foam hearts. I got both at the dollar store for a buck each. 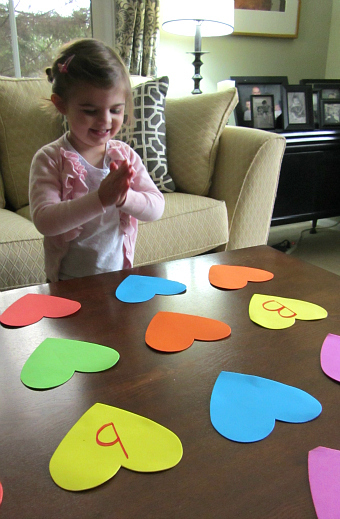 Write out letter pairs with one upper and one lowercase letter. I didn’t do the whole alphabet , I rarely do. I choose letters I know she knows ( M, A, J) and some I know she struggles with ( Q, G, ) and fill in the gaps randomly. Also each pair is done in the same color. When we played I told my daughter to find the same color. This made the game much more accessible for a 2 year old and gave her color recognition work to boot. Lay out your hearts face down. Play. She was enthusiastic immediately. I demonstrated once and she was off. We left our letters face up in their own spaces when we matched them up. 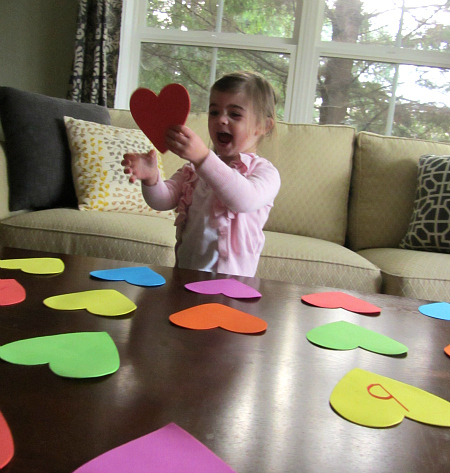 She was thrilled when her letter ( M) was flipped over and even happier when she made a match. The first time we played she called the Q a “funny O” we tried to figure out what letter is was and I ended up labeling it for her and we kept playing. The next day ( we’ve played daily for 5 days in a row so far) she called it a Q and matched it to it’s lowercase letter without any prompting. No drill needed , just a fun game. Celebrate with each match and hoot and holler when you have completed the whole game! 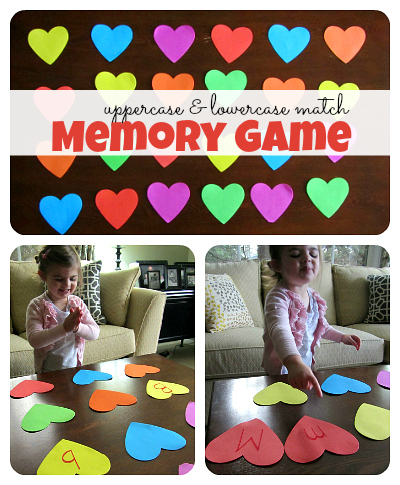 I often gets asked if I play against my kids for memory games. Sometime I do but usually I don’t. We play as a team . 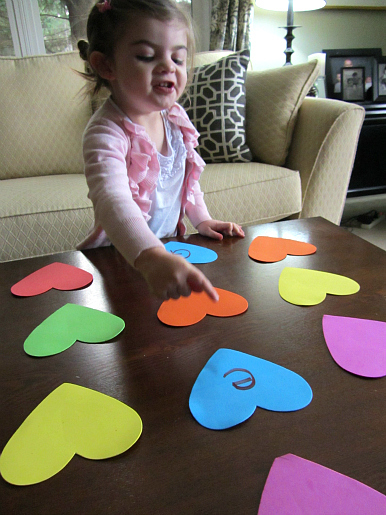 For my daughter with a game like this I will narrate with her after she identifies a letter unprompted I will say ” Hmm I wonder which heart the lowercase B is under ?” or some such thing. If she is having a hard time with a letter. I will try to ask questions to help her instead of just telling her. Like with the Q I said ” What letter do you have ?” and she answered ” A funny O.” then I said ” What makes it funny?” ” It has a tail Mama!” . To which I replied ” Do O’s have tails.” and she giggled saying “No!” and I said ” That is a an uppercase Q.” Even at such a young age kids can help figure things out and when we engage them like this they learn to ask questions , answer others and not just guess at the right answer. Thanks for all of your excellent posts! 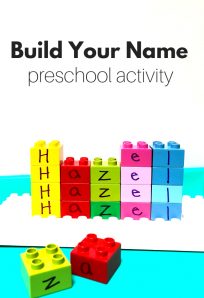 I use a few of them every week with my 3 year old & 18 month old, and the kids really look forward to these engaging activities. Just noticed we have the same fabric on our sofa, ha ha! Ah thanks Allie for sharing out letter match too! I love the memory game addition to it, as well as the color matching part of it. That would work well for my 2 year old too. What a great idea! 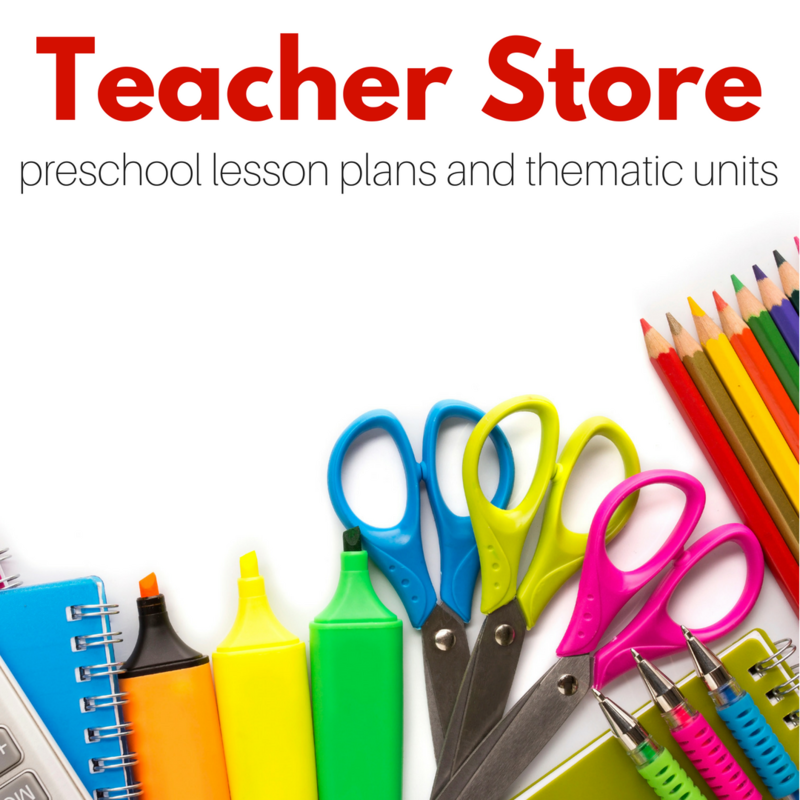 I am an EFL teacher in Greece and have a lot of nursery aged students. 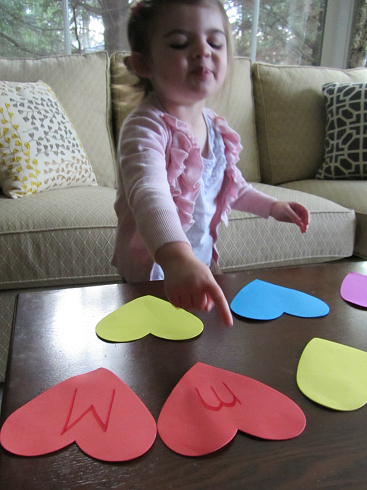 Your craft ideas are wonderful and the kids love them! I ‘ve been playing different versions of memory for years but never thought to do it with the alphabet. Thank you for all your inspirational ideas! 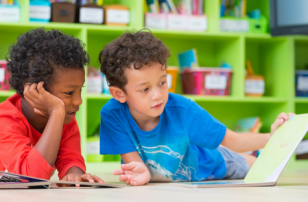 Research has shown that children the letter O, X, A and S first so I would start with those and then the first letter of each child in my class. 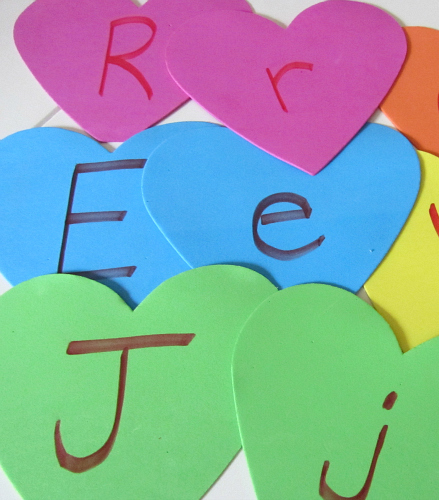 The research is mixed, I have read various suggestions from different approaches – in my book we talk about starting to write X and O first but for recognition having a meaningful attachment to the letter is still how I would suggest. Ultimately I don’t think there is only one way. If you fee comfortable with your system, that’s great. The activities are very interesting for my kids. Thanks so much for these exciting, super cute & fun ways to teach our kids without them knowing that we are teaching them! My 5yr old is a little behind on recognizing all of her letters and numbers due to having to switch pre schools half way through & starting over with a new teacher, kids & curriculum. It was really tough on her. And as her mom it breaks my heart & naturally I want to help her of coarse. So I’m excited to try this activity along with a few others I’ve seen on here in hopes I can help her catch up and have fun while doing so! Any suggestions please let me know! Would very much appreciate it Thanks again!! !